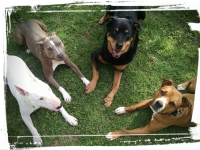 Dog obedience training & socialization programs customized to fit your needs. Find out "WHY is my dog doing that?". Learn how to prevent and stop unwanted problem behaviors such as potty "accidents" in your home; jumping on visitors; nuisance barking; chewing, mouthing, or nipping; pulling or lunging on the leash; and reactivity or aggression towards people or other dogs. You'll teach your dog to listen to you; come when called; walk nicely on-leash; enjoy using the crate; lie down and stay put until released; and be polite toward people and other dogs. You'll also learn the best ways to properly interact and socialize with your dog so your dog learns to be a polite member of your family. These programs will set your dog up for a lifetime of success! Teach your dog the basics! Get the dog you can be proud of! If you have a more difficult dog, a busy family, or just taking an extended vacation, we can provide the initial training for you while keeping you involved in your dog's training with follow-up lessons. Your dog will be treated like family, living in our home, happy and busy all day training, socializing and playing with other dogs, as well as working through any unwanted behavioral issues. This is a concept your dog can understand, relate to, and transfer back home. During your dog's stay, you will receive photos & videos of your dog so you know how your dog is doing. When your dog returns home, you will be provided with several follow-up lessons to ensure your dog's success and not undo your dog's training. You'll learn what is needed to reintegrate your dog back into your life, continue reinforcing what your dog has learned, and get answers to any questions you may have so you can prevent your dog from reverting back to old behaviors. Our most popular dog training program! Get the extra help your dog needs! Dogs who have completed training with us may stay with us. Your dog will be allowed to socialize and play with other dogs who are staying with us. We will also work on those difficult issues you are not able to resolve while providing maintenance of any training your dog has already received. 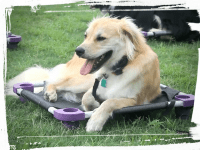 We provide the opportunity to help dogs with poor social skills who may otherwise be excluded from dog parks, doggie daycares, or play groups. This is not free-for-all playtime. Social sessions are small and highly structured. 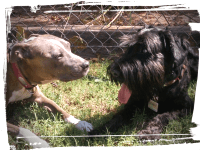 Each dog is advocated for and we help them to make better decisions. Using their natural conflict resolution capabilities, dogs learn how to calmly coexist, mingle, and interact under proper supervision, enhancing their social skills and building their confidence. Unlike dog parks, each dog is screened for health issues and evaluated for dangerous behaviors. 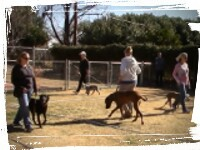 In addition to this screening process, our dog trainers know how to recognize and avoid trouble before it starts. If any dogs do get into trouble, we are there to get them out of it without making things worse. The results are well-behaved dogs who learn to actually enjoy being around others. Take your dog's training to the next level! These classes provide opportunities for you to practice helping your dog to calm down, behave, and listen to you around distractions in a controlled setting. Your dog will learn to be more relaxed and confident around other dogs and people. you'll find a way to get results. If not, you'll find excuses."